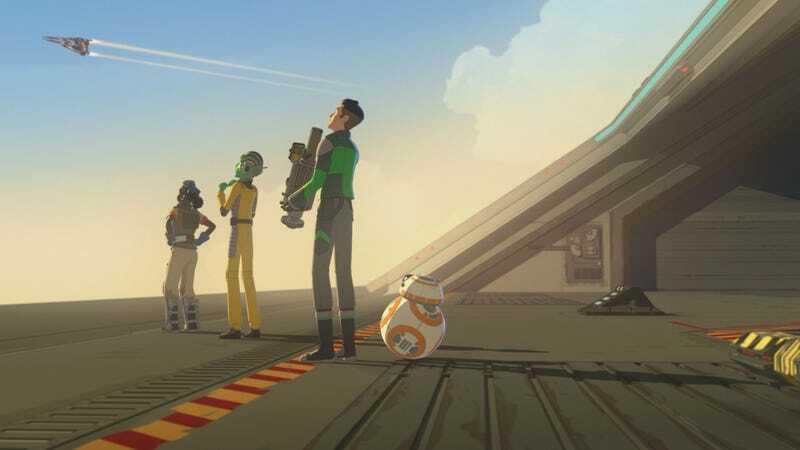 We’re all looking to the skies about Star Wars Resistance. Even though we’re two-thirds of the way into the latest Star Wars trilogy, there are still tons of questions about what happened before those films—about the First Order, Supreme Leader Snoke, the Knights of Ren, and so much more. And, with any luck, Star Wars Resistance won’t answer any of them. 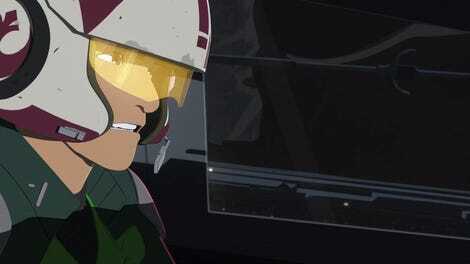 Resistance is Disney’s brand new animated Star Wars series, following in the footsteps of Clone Wars and Rebels. However, while both of those shows were set before the original film trilogy, Resistance is the first show set after those films, telling a story about the Resistance (duh) battling the First Order, much like we’ve seen in The Force Awakens and The Last Jedi. The fact that the show’s storyline deals with that conflict makes it hypothetically possible that it could handle some of those lingering movie questions. Plus, Star Wars animated shows have, in the past, answered big questions from the movies. Clone Wars famously revealed the whereabouts of Darth Maul and gave some context to Force Ghosts. Rebels showed us the final showdown between Obi-Wan Kenobi and Darth Maul as well as some key connections to Rogue One. And while there is no doubt Resistance will answer some questions and link up to some parts of the franchise, we truly hope that’s not the focus of the series. Kaz hanging with a big star from the movies. So far only two episodes have aired, but even from those, you get a hint of what Resistance is all about. It’s set in a whole new world. A world removed from outright war. A world where ace pilots can race to see who’s best. Almost a dozen brand new characters are introduced or teased at the start of the series and if things started to go off and explain Kylo Ren or Snoke, it would be a massive disservice to them. Now, do I want to know more about the Knights of Ren? Would I like to see how Snoke came to power? Of course I would. And I’d be all for those characters appearing on the show in some form, especially since Kaz’s mission could be so detrimental to the First Order. But it would have to be done right—like the decision to bring movie characters Captain Phasma and Poe Dameron onto the show. Fans shouldn’t expect every new piece of Star Wars to fill in gaps from other Star Wars projects. I’m as guilty as the next person when it comes to wanting that type of thing, but then I look back at the Star Wars stuff I love the most. None of it is there to fill in gaps. It moves forward, giving us new and exciting characters on their own adventures. On the other hand, sometimes there are questions that have to be answered. Questions like the ones posed at the end of Star Wars Rebels as to the whereabouts of Ezra Bridger and the team-up of Ahsoka Tano and Sabine Wren. In fact, those aren’t questions as much as they are cliffhangers and the promise of more to come. And many could assume since Resistance is the first show released since Rebels and is set around the same timeframe that series ended, this is where those things could come into play. But, again, I hope not. It’s just too soon and too removed from what Resistance seems to be setting up. Would you really want to see Kaz be the key to this incredible mystery regarding the two Jedi (Ezra and Ahsoka) alive in the time of Rey and Kylo? No, that feels like its own, much more complicated, story to be told. It’s still crazy that Oscar Isaac voices Poe on Resistance. Thankfully, after speaking to one of the show’s executive producers Justin Ridge, it seems all of this could be a non-issue. Resistance is set fairly close to the events in The Force Awakens (about six months, he said) so everything we saw in that movie is going to start happening very, very soon. Hell, we may even see the characters on Resistance react to the events in that film as well as The Last Jedi (since, after all, they take place back to back over a fairly short period of time). To that end, Resistance may be a show that doesn’t give us answers, but instead poses even more questions. It could potentially be our best glimpse yet at a universe post-The Last Jedi, a place where that titular Resistance is in need of a spark. Personally, that seems like a much more exciting place to build to, if it’s building to anything outside itself at all. It would also be perfectly fine if these pilots flew far away from the conflict and showed us what’s happening a billion miles away in Star Wars. That, to me, would be the most exciting question that could be answered: What else is out there? Star Wars Resistance airs Sunday nights at 10 p.m. on the Disney Channel.